Confessions of a Semi-Slacker Mom: Up to My Ears! Since it's almost November & finally getting cooler, I decided it was time to pull out the fall/winter clothes. So I go down to my storage/ "junk" room in our basement (the only room in the whole house that I can call my own!) to tackle the masses of clothes! I have tons of hand-me-downs for Bo & Baby Girl, plus I've saved all Sassy's stuff, and since the clothes were starting to take over the hallway, I decided in was time to go through all this stuff! That was 2 weeks ago & I'm still not completely finished!!! Since there will be no more babies in this house, I got rid of any girl clothes smaller than 2T & any boy clothes smaller than 3T. Needless to say, that equals about 7 large bags & 1 huge box. The box is for Goodwill, the bags are to be distributed to various friends & family members. After this task is complete, I finally can retrieve our fall/winter clothes & take them upstairs to organize. 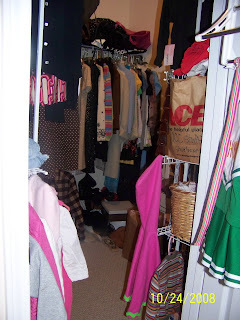 I know this is awful, but I keep all of my children's clothes in my room - except for Sassy, I just have her good (read: school, church) clothes. So I have all these clothes & not enough room for all of them! And let me just tell you, I had more freakin' clothes hangers than Target! Matt Lizzie took some home, but I know I threw away about 2o0 hangers. And kept more than that! I can't stand those cheap, hard plastic hangers you get at stores. I prefer wire hangers!!! Yes, Mommy Dearest. My favorite are the clear plastic hanger with the metal hook. Okay, that's enough of my hanger complex. Cleaning out the closet & drawers leads to about 4 more bags of clothes to get rid of. It's going to be an even bigger pain in the arse to distribute all this stuff. Especially the Goodwill box, I know it will sit where it is for 6 months. At least it's all contained in on spot! So when I finally get all the clothes put away I will be done!!! My "junk" room & my closet are both nice & organized. I may have to get another chest of drawers, Bo & Baby Girl will hardly have to wear the same thing twice, they have so many clothes! Sassy, on the other hand, has plenty of clothes but only chooses to wear certain things. But THAT is a whole other post. My junk room. Yes, the whole center section is Christmas, plus some!! My closet is bigger than it looks in this picture. It was hard to get a good shot. And let me you, it is full to capacity! This is the stuff I'm KEEPING! Not counting the bag of clothes in my hope chest that I just couldn't part with. 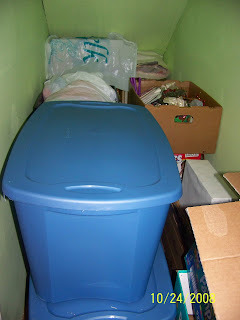 My junk room closet (under the stairs) is also nearly full to capacity! If I ever get around to organizing my house I might actually have a new closet (make that two) to use. But other things always come up & we never do it. I can't wait until my in-laws come to visit and see my house! Maybe that will get my Hubby to finally work with me! Good for you! Tackling clothes can be as draining as organizing papers, because you have to touch each item and make a decision on so many items. 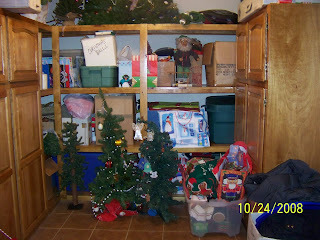 Stop by my blog if you are looking for some organizing tips. Take it step by step and break it down-don't forget to reward yourself! Especially if you've lost weight. Have clothes in your closet that you look and feel great in! How nice to have a junk room like that! I'm impressed, it looks fully presentable. No cobwebs or other unmentionable creatures scurrying through your stuff. Thank you for letting me peek in your closet! I always have fun peeking in other people's closets. Noone ever seems to let me, though. You have a nice looking closet. Sounds like you got a lot of work done. Good for you! You had me laughing out loud reading your posts. I am really enjoying them. You are right- you have lost some weight, a lot. You look great. I am jealous. Keep it up and I must say i am so impressed with the organization. Let me know when you can come get me organized. Good luck with all the closet organization. I need to do the same, but keep putting it off!